(CAPTION: I SPENT THE NIGHT AT THE BARBARY COAST AFTER COVERING THE MGM FIRE. 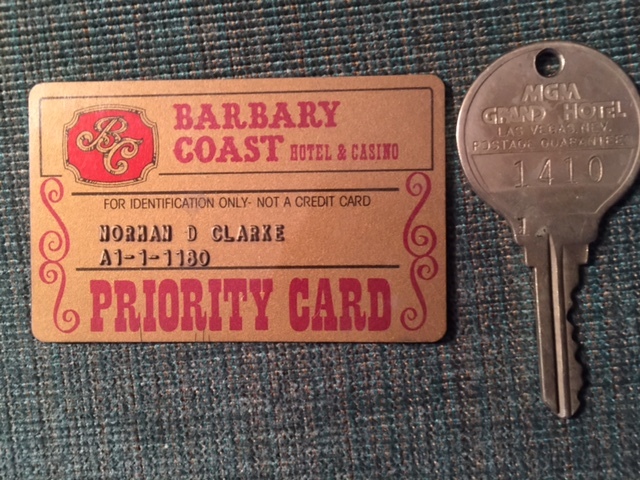 AT RIGHT: MGM ROOM KEY 1410, GIVEN TO ME BY SURVIVOR RANDY HOWARD IN 2008 AFTER HE RETURNED TO LAS VEGAS FOR THE FIRST TIME SINCE THE FIRE.) PHOTO: NORM CLARKE Before the Mandalay Bay shootings, there was the other another tragedy of unimaginable magnitude. It happened 37 years ago today (Tuesday): the MGM Grand fire left 85 dead and 650 injured. I was working for the Associated Press in San Diego, having transferred there in 1979 from Cincinnati where I got my start with The AP in 1973. I was living in a tiny two-story stand-alone on Mission Beach. My phone rang about 7:30 am. It was AP headquarters in NYC. Fly to Vegas ASAP. MGM Grand is on fire. "Could be 400 dead." L.A.-AP was sending reporters as well. Photographer Lenny Ignelzi & I spent the next week In Las Vegas. One day after the fire I tracked down survivor Randy Howard in Silvis, ILL. I had seen TV footage of a guy in a cowboy hat escaping down a rope thrown from the roof of the hotel by Nellis airmen. Turns out it was the 14th floor. He had an incredible story, not just how he survived but his backstory as well. He was a drug dealer on the run. He had flown from Illinois the day before to Reno, where he planned to rent a car and head for Mexico, leaving behind a fiance, a pregnant girlfriend and his drug dealing operation that involved long-haul marijuana runs from Florida. He partied late into the night in Reno and decided to take a side trip to Las Vegas before spending the rest of his life in Mexico. He flew to Las Vegas, got a room at the MGM after tossing $100 bills at a receptionist, who had informed him they wouldn't have any rooms until early afternoon. He slept all day and decided to see the Ann-Margret show at Caesars Palace. Told it was sold out, he pulled out $100 bills until the maitre 'd accommodated him with "a little round table not much larger than a pancake," Howard told me. It came with a folding chair placed at the center of the stage -- best seat in the house. When Ann-Margret saw the cowboy with the "V.I.P." arrangement, she chatted with him between songs. Howard told me he had the cocktail server bring his two beers at a time and tipped her $100 bucks per trip. The ex-Marine estimated he drank two six packs but he couldn't shake the feeling of the mess he left behind. His cocktail server invited him to party off the Strip with her after the show. It was going to be his only night in Las Vegas, why not live large? But his drug-running instincts kicked in. He thought he was being set up. Howard decided to call it a night and headed back to the MGM Grand. Before falling asleep, remembering the regret, drunk as he was, of royally screwing up his life, he told me. About 4 hours later he was awakened by what sounded like late-night revelers outside his door. There was yelling and someone was pounding on his door. Sirens blared outside his window. When he peeked through the window, it was completely dark out. But when he opened the balcony door, thick black smoke poured in. The MGM Grand was on fire! He continued crawling past bodies. He prayed for a miracle -- and got one when he looked through an open door and saw a rope swing by. Dazed and coughing from smoke inhalation, he continued down the hallway and found an open door with a desperate group of people on the balcony. Howard rushed toward the front of the line and the rope, but was turned back by two men. One said, "Don't try it. The rope is too far away." Howard pretended he was walking away, then turned back, rushed past the two men, pulled himself up on the railing and took a leap of faith. The rest of the story will be in my book about the most inspirational people I've met in my career. The book will be out next summer.